Like Ahab pursuing his mythic white whale, I’ve been on the lookout for Dancing Camel beer since my arrival in Israel now some 10 days ago. I’ve been close a couple of times – once today, at the shuk (Mahane Yehuda market in Jerusalem), where I’ve found the Dancing Camel beer line before. And before that a number of days ago when I was in Tel Aviv just a half a mile from the brewery/restaurant itself, only to discover that it opened later in the day, and my schedule would not permit waiting. In both cases the Camel eluded my grasp, slipping away just as I thought I had it in my sights. But full confession – my disappointment has been tempered by the craft beer scene here in Israel, which is exploding. There are dozens of breweries, producing hundreds of beers, a number of them quite good. From Dancing Camel in Tel Aviv to Shapiro Beer in Jerusalem, from Malka in the north to Herzl Brewing with its ‘blibical beer,’ Israeli brewers are perfecting their craft and producing a variety of stouts, porters, IPAs, dubels, and wheat beers that are delicious and truly worthy of the ‘craft beer’ designation. We emerged from our tour of Akko with its Crusader period ruins, through a gift shop (of course!) and out into a tiny alleyway that leads back to the main square. Just a few steps down the alley and you’ll find a small Malka Beer ‘tied house.’ The tart and citrusy IPA was a perfect thirst quencher on a hot day of touring. Or the shuk itself! Mahane Yehuda can try the patience of a saint on a Friday afternoon, but these days it is filled with tiny bars and pubs where you can cool off, cool down, have a nosh, and of course drink Israeli craft beer. I watched the undulating sea of shoppers jostling along the market’s narrow thoroughfares while sipping a fruity Pale Ale made by Shapiro Brewing in Jerusalem. With a palate scorched by the IPA/DIPA craze in the Sates, this pale ale was a welcome throwback to the nascent days of the American micro scene and beers like Geary’s Pale Ale and the original version of Sierra Nevada Pale Ale. What better way to wash down felafel in pita? Last but not least the Glen Whisk(e)y Bar, located in the heart of Jerusalem (Shlomtziyon HaMalka 18), just a short walk from the Mamilla Mall. In a room the size of many American kitchens the owner of this classic bar has assembled one of the largest whisky collections in Israel. But don’t forget about the beer! 15 taps, all pouring Israeli craft beers, the lines well maintained, the beer served to perfection, the pints filled to your heart’s content. My only complaint? Even there, at Jerusalem’s beer mecca, there was not a Dancing Camel to be found. Just one more reason to come back to Israel soon! Cheers, or should I say l’chayyim! It was a 1979 Peugeot 504 diesel. A nondescript brown/grey color, stick shift, manual sunroof, four door. It was slow as molasses, the diesel engine struggling to propel the car up any incline of even moderate degree. The back of the car – bumper, rear window, heck even the side windows – entirely covered in Grateful Dead stickers. I remember at one point counting them, and there were more than twenty. I actually had a debate with my dad about whether there was still enough room to see safely with the rear view mirror because the stickers blocked your view. I drove that car my senior year of high school and freshman year of college. It was no frills. No AC. Hand crank windows. No power steering or power brakes. It got great mileage – I could make it from Boston to Binghamton NY on a half a tank of diesel fuel. The trunk was not huge, but I could get everything I owned in that car – everything – including my Polk Audio speakers, always stacked in the back seat. One time I even had a keg of beer in the trunk that made loud clunking noises every time I turned or accelerated. I had installed an Alpine cassette deck/radio in the dash. It played through the tinny speakers, and I kept a small wooden box filled with Maxell cassette tapes on the carpeted mound between the driver’s and ‘shotgun’ seats. That old Peugeot rarely started in the winter. There was a heating element for the engine that you turned on before you tried to start it in the cold, but it didn’t work well. In cold weather I always parked at the top of a hill, and would gather 3 or 4 hearty friends to push me out into the road. If you kept your foot on the clutch, and the car managed to get to 10 or 15 miles an hour drifting down the slope, you could ‘pop’ the clutch (suddenly release it) and the engine would cough its way into running. Sometimes you had to do it a couple of times before it would start. If you got to the bottom of the hill and it didn’t go, you were out of luck. Wait until spring, I guess. We had all kinds of adventures in that car. There was the time in the snowstorm, when my friend reached from the back seat and released the sunroof, allowing 6 inches of snow to tumble into the front seats. Yes this was while we were driving. There was the drive back from Baltimore in 1982, having seen the Dead at the Civic downtown, when the windshield wiper fluid ran out. It was early spring, the Pennsylvania roads were covered in brown slush and dirty, melting snow. As I drove, my friend reached out the window with tissues and tried to wipe it clean every few minutes. One New Year’s eve in a heavy snow storm the car slid 5o yards down a steep road, gently and softly settling into a mound of snow before sighing to a stop. There were late nights and early mornings, full moons surrounded by bright stars, hazy sun rises, trips to the beach, long rides alone singing along to a favorite song or gazing out at the beautiful rocks and trees of western Massachusetts. Dozens of Grateful Dead shows. Stops in Buffalo and Saratoga, in Harrisburg and Hartford, in Portland and Syracuse. Endless miles. The road does indeed go ever on and on. That car transported us. Physically of course, taking us from place to place, that unimaginable sense of freedom, of knowing you can pretty much go anywhere at anytime. But also metaphysically, transporting our minds and hearts, our souls and spirits, those shared moments of joy and laughter and struggle and adventure that would never happen again. Eventually that old Peugeot gave up the ghost. Some irreparable, fatal flaw developed – the engine block cracked, I think. It was put to pasture in a junk yard somewhere, rusting in the summer rains and cold winter snows of upstate New York, Dead stickers slowly fading over time. It wasn’t a great car – slow, difficult to drive, mechanically flawed. But it was a classic. And they just don’t make ’em like that anymore. The image of an altar is at the center of this morning’s Torah portion. The text is mostly a description of an ordination ritual for Aaron and his sons, preparing them for service to the Israelite community as priests. The ritual is conducted around an altar, with three sacrifices offered, and the sprinkling of blood, both onto the altar itself and onto Aaron and his sons. It is not surprising that the altar would be a central image – as an object, it was a crucial component of the ancient sacrificial system, that was practiced by our ancestors until the Temple in Jerusalem was finally destroyed, some 2000 years ago. The altar that our ancestors used for their worship is described in great detail in the Torah. It was to be made of stone, un-hewed, to be of a certain size, and perhaps most interestingly to have four horns, one at each of its corners, emerging from the flat surface of the top. Just a little over a week ago I was in Jerusalem with the 47 people who traveled on the Beth El trip that returned this week, and we had the opportunity to spend an hour and a half or so in the Israel Museum, one of the great museums in the world, and certainly containing one of the finest antiquities collections anywhere. As I wandered around the museum I rounded a corner, and standing right in front of me was an altar, found at the excavations in the south of Israel, in Beer Sheva, constructed exactly as the Torah describes it – the stone construction, the dimensions, and most noticeably the four stone horns sticking up from the corners. That altar in the museum is about 3,000 years old, and coming face to face with it, the very week when we began reading the book of Leviticus, with its focus on the sacrificial system, reminded me of the concrete reality of the Bible, the historical memory of the text, in a way that simply cannot happen here in the States. Of course if you’ve been to Israel you know these experiences happen on an almost daily basis. The apartment where Joseph Caro wrote the Shulhan Aruch is in Safed. The stones of the Roman streets where Rabbi Akiva walked are still in Jerusalem. The ancient synagogues, the villages from the talmudic period, the list could go on and on. One does not read about Jewish history, or study Jewish history, in Israel – one lives it, walks on it, touches and feels it, lives and breathes it. There is nothing else like it. And if ancient Israel doesn’t overwhelm you, modern Israel certainly will. I’ve been to Israel seven times in the last 10 years, and each time I arrive the skyline of Tel Aviv has changed, new sky scrapers emerging one after another after another. The sleek light rail now runs noiselessly in Jerusalem. A high speed train is being built so commuters can get from Tel Aviv to Jerusalem in about 25 minutes. We visited an Israel tank unit that was stationed on the Lebanese border, and the young soldiers proudly told us their tanks were the most advanced in the world. Google and Intel have strong presences in Israel, and all over the world people use apps – like Waze, for example, the popular traffic and direction app – that have been created by Israelis in Israel. But in my mind the moments that stay with you, the moments that touch you in the deepest way, are the human moments, the interactions with people that remind you of the special spark and spirit in the people of Israel that have made all of what I described above possible. Let me briefly share with you three such moments that we experienced. The first was election day. We were in Tel Aviv, and we took a walking tour through the city that day. Election day is a holiday in Israel – most businesses and museums are closed. There was a festive atmosphere in the air as we walked through the streets. Polling stations were buzzing with activity, and as we walked by campaign workers handed us flyers praising one party or another. Everyone was excited, invested in the election, talking about the parties and candidates, and in true Israeli style holding no punches. Some wanted this candidate, some wanted that candidate. Some were Bibi fans, others not so much. What was striking about it to me was how different it felt than an American election day. There was a sense of joy to it all, and in a way it felt like a celebration of the country itself, and an affirmation of its democratic character and values. And maybe that is why close to %80 of Israelis voted that day. This was Israel at its best, expressed through its people – vibrant, filled with energy and joy, with a palpable spirit of optimism and hope in the air. Vignette number 2. We visited the city of Ashkelon, Baltimore’s sister city, and spent a morning at Netzach Yisrael, a Masorti, or Conservative synagogue there. We were welcomed warmly, and sat watching the congregation’s rabbi and its teachers conduct a morning learning service with the pre-schoolers. They prayed, they sang, they laughed. The teachers put on a wonderful mini-play about Moses that completely captivated the children. Few things bring joy to the heart like the singing voices of young children, and in this case, with their enthusiasm, and of course with everything in Hebrew, everyone in the group was touched. Afterwards, we spent time with members of the congregation who generously shared their stories with us. There was a woman in her 90s who made aliyah from New York now almost 40 years ago. There was a young man from Cuba who made aliyah just a few weeks ago. And we were treated to a wonderful surprise – Hannah Deoul, a young woman in her early 20s who grew up at Beth El and had her bat mitzvah here, came to meet us. She made aliyah 6 months ago, lives in Ashkelon, and who was recently named coach of the under 19 Israeli women’s national lacrosse team. She was beaming from ear to ear as she told us about how much she loved being in Israel, and as a rabbi who was at her bat mitzvah not so many years ago, I can tell you our entire congregation should be proud. Last but not least I return to the Israeli tank unit we met in the north. These young soldiers, 18 and 19 years old, flocked around us as we asked them questions about their jobs, their backgrounds, and their families. They were gregarious, happy to talk, and probably glad to have a brief break in their daily routine. They were in turn playful and serious, with the souls of boys, silly, jumping in front of one another when we took pictures. But they have the responsibility of men, guarding their country at its northern border, a responsibility I can assure you they take seriously and perform with great distinction. They invited us to climb on top of their tanks, which a number of us did, although we were told to please not take pictures. Dr. Bor took out his clarinet and played some Israeli music, and then the Cantor, who was standing on one of the tanks, spontaneously began to sing Hatikvah in his powerful voice. Suddenly everyone joined in, our congregants, Jews from Baltimore in their 40s, 50s, 60s, or 70s, and the young Israeli soldiers, singing together. We knew in that instant that although we live in different places, and have had in many ways very different lives, we are truly connected as part of one people – Am Israel – sharing a hope and dream for a future of peace for all people. As you may imagine, there was not a dry eye. So there you have it. A brief snapshot of our trip, and perhaps of Israel as well. May the hopes that we all have for her truly be fulfilled. And one day soon, may she know a world where the hearts of all people are turned towards one another in peace. The title of a walking song/poem composed by J.R.R. Tolkien. As Bilbo the hobbit leaves his home for the last time he softly hums it to himself, walking quietly into the gloaming. Its words speak to any traveller – “the road goes ever on and on, down from the door where it began; now far ahead the road has gone, and I must follow if I can, pursuing it with eager feet, until it joins some larger way, where many paths and errands meet; and whither then? I cannot say – ” You never do know exactly what adventure is waiting for you when you walk out of your front door. Early Thursday morning I leave for Israel, with 47 congregants and staff. One of the many Israel trips I’ve had the privilege of participating in over the years. The itinerary is often similar, but each trip has its own unique character and flavor. The group. The weather. The guide and the bus driver. The ‘matzav’ (the current situation in Israel). In the course of this journey I’ll be blogging when I can and also sending out tweets with updates about where we are and what we are doing day by day. You can find me on Twitter @sceezo. Of course crucial to any journey is the packing. Which items will I need, which can be left behind (the answer is always fewer of the former and more of the latter)? What will be forgotten, and when will I realize it (inevitable!)? Will I finish my first book and get to a second (admirable thought, but unlikely)? If I forget x, y, or z, will I be able to find it there (yes)? And how much will it cost (alot!)? 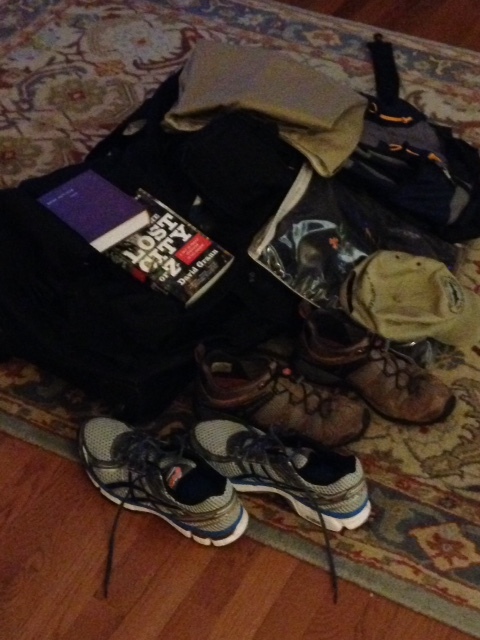 Because of a particularly busy Wednesday, I have started my packing one day early (a very unusual phenomena for me!). Here is a shot of how it is all coming together.